PARIS, FRANCE – 1918: American Red Cross executive secretary Marzita Savord poses in a Parisian studio showing off her American Red Cross uniform and French coiffure. Because of her high level security clearance she was present during the Peace Treaty signing in Versailles on June 28th, 1919. 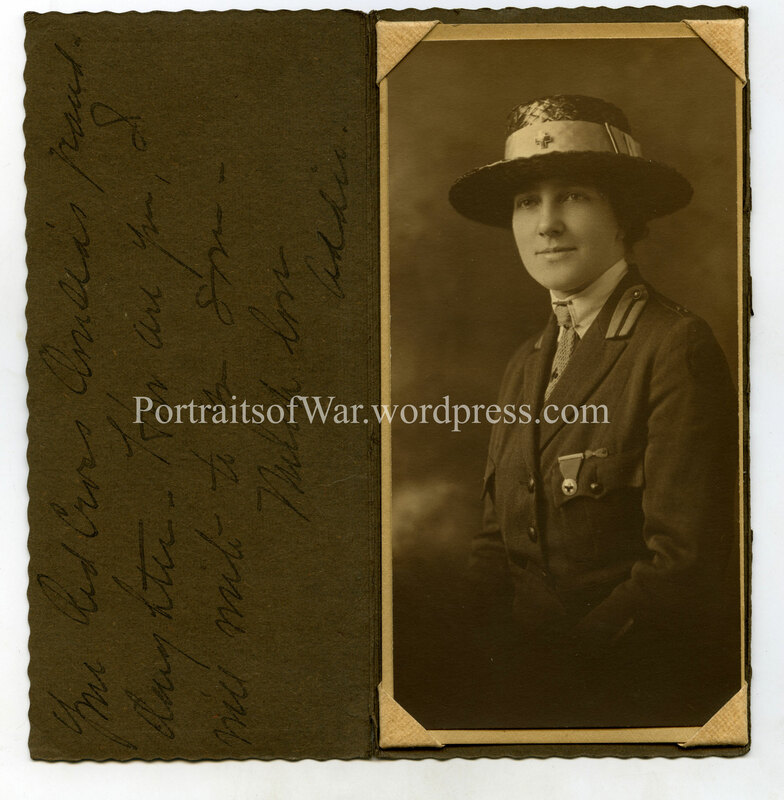 Marzite served overseas for nearly two years before returning to her hometown of Sandusky, Ohio in 1921. My first major cover photo! Photo is of Mortimer Thompson when he freshly arrived from overseas service in 1918. Photo was taken post-war, indicated by the single “discharge” chevron on the left sleeve which was crimson in color. Double “overseas” chevrons above the cuff on the left sleeve indicate this man was overseas in the combat theater for 12 months (1 chevron per 6 months). Double “wound” chevrons above the cuff on the right sleeve indicate this man was wounded by enemy fire twice (predecessor to the Purple Heart). Button on the overseas cap is the AEF Discharge Pin which later also became the logo for the American Legion. Also, he is wearing a French made Overseas cap and has a medical disc. He might have been a medic? Brennan: I found this site by searching for The Electric Studio. 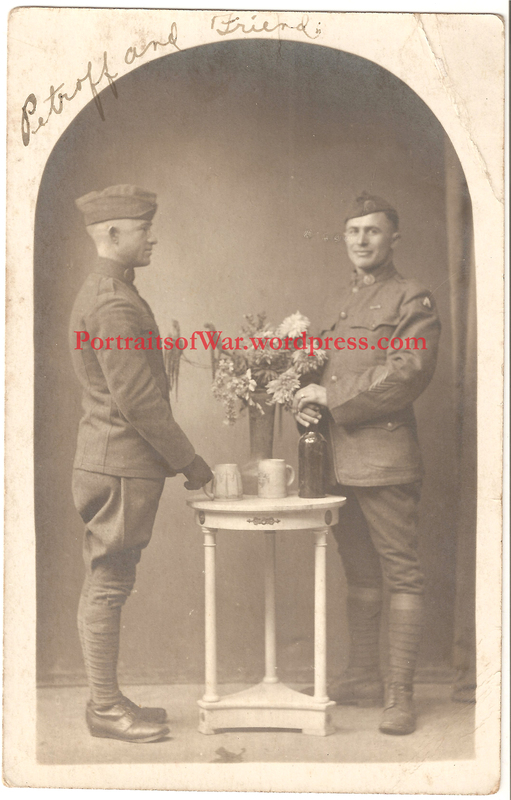 On the weekend I bought a few WWI real photo postcards printed by the company. Searching for the studio name, your site came up when I looked for images. Thanks for this work — of course I want more war photos. Great that these ended up in your collection. Thanks for the compliment. Glad I could be of service. 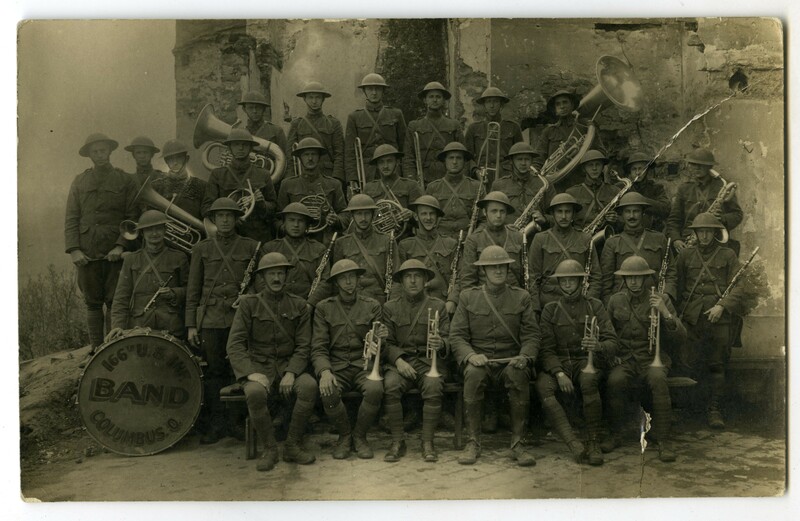 WWI real photo postcards are incredibly fun way to learn about WWI history as well as historic photo studios both at home and abroad. 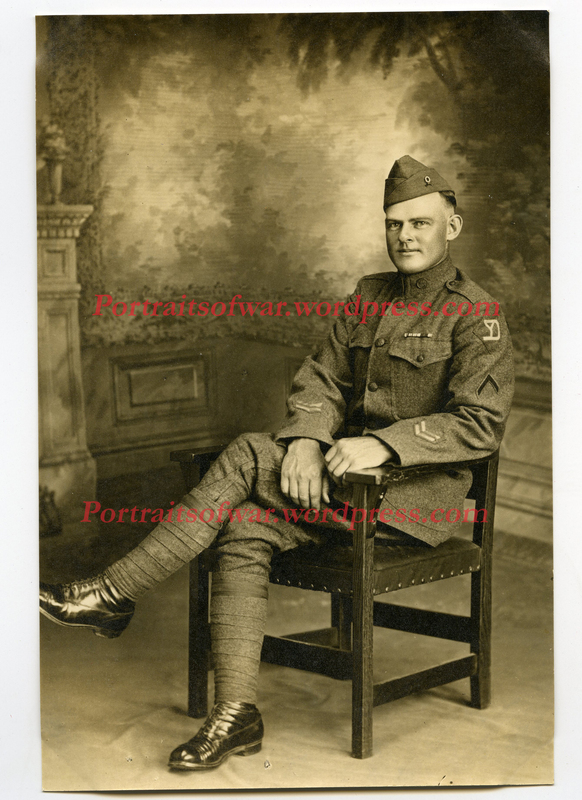 Looking for a picture of Harry J. Conway, he was in WW I, from Sabattus Maine. Our Legion Hall is named after him and we would like to find a photo to hang in the hall. Comment: Enl: NG Lewiston, Apr. 8/17. Reported for Federal Serv: July 25/17. Private. Org: 9 Co CA Me NG (25 Co Portland) Apr. 8/17 to Jan. 1/18; Btry F 54 CAC to May 17/18; Btry C 57 CAC to Nov. 8/18. Eng: Toul; Argonne Forest; St Mihiel. Overseas: Mar. 22/18 to Nov. 8/18. Killed in action: Nov. 8, 1918. I will try to track down a photo in the 57th CAC unit history. Give me a few weeks. I am currently in the process of assembling images for a book project. All images are interior formal studio portraits of african american servicemen taken from the early 1900’s through the early 1960’s. Would you be interested in adding to the mix? Of course we would credit yourself and your archive. Please let us know if you might have an interest. Sure thing! How can I get them to you? Love your site–thanks for having it! I’m looking for an image of Pvt. William C.N. Boylen, Co. L 101st infantry, 26th division. Killed at Vaux, Chateau Thierry, July 20, 1918. There’s a memorial stone (on a street ‘island’) for him–“first Melrose [MA] man with the American Forces killed in action in the World War.” but NO ONE in the city seems to know anything about him. I’ve found all I can re the family via Ancestry–no photos though and no luck with relatives. So–I’m hoping you’ve got some other lead. Thanks so much. And keep up this great site. Linda G.
Fascinating pictures. I do miss that group motorcycle shot that was your lead in photo. I just discovered this website. My grandfather was a member of the 104th infantry (Company M) and I am slowly but surely gathering information on what happened to his unit. Sadly, most of his military records were destroyed, so sites like this have been invaluable. I do know he was awards a bronze star with oak leaves (I believe that’s the honor) for leading a charge in the Argonne offensive, but that’s about it. I loved reading about how they earned the Croix de Guerre. BTW, his name was Lawrence Russett if he ever shows in your research. Where was he from? When was he born? I’m guessing it’s the Connecticut/RI area in the 1895-1897 time frame. Our family’s cousin, Joseph W. Powers was also in the 104th, Co. M. He died of his wounds on 20 July 1918, after the Battle of Chateau Thierry. He received the Purple Heart. My father was a veteran of Korea and Vietnam, and the oak leaf cluster on a Bronze Star means he was awarded more than one. A special combat Bronze Star is awarded a “V” for exceptional valor. 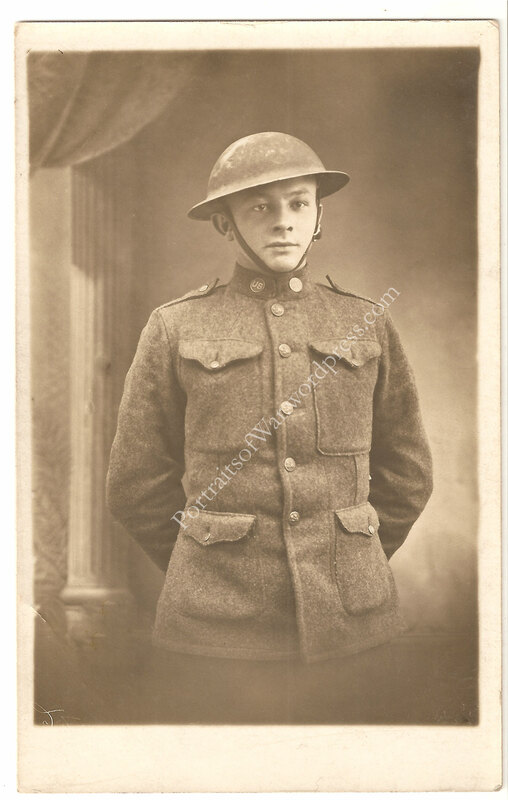 I too am the granddaughter of a veteran of the 104th infantry (Mechanic Co. H.) His name was Everett Hamill Keyes, b. July 29, 1895 in Worcester, MA (from where he also enlisted in June 1917). He died before I was born, but his obituary says he earned the Croix de Guerre, Purple Heart and Silver Star. Do you know how I could verify that information? Any other information/photos you can find would be very much appreciated. Thank you! I might be able to find a photo of him, but it will take some searching and a little luck. Hope this helps. Is this his draft card? Hi – I don’t think that is his draft card. While I don’t have a DOB for Frank, he was born in Ireland for sure and immigrated in 1907. I don’t know that he lived in Hyde Park either…but, he did live in Jamaica Plain (right next to HP). I don’t want to rule this card our completely – but I was told he may not have a draft card since he enlisted in the army in 1916 to serve on the Mexican Border. I’ll have to save this card – but I don’t think its him? Thanks! 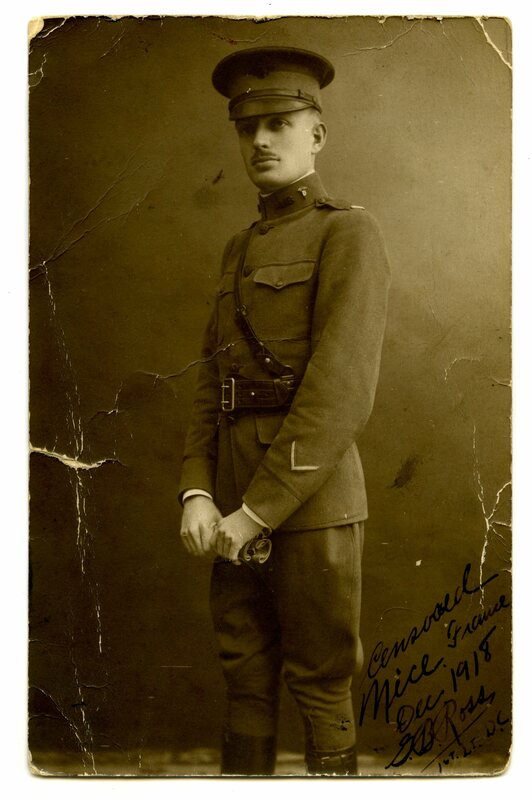 Not sure why I didn’t see this 2 days ago – but yes, I do believe this is my Frank as I do know he was awarded the French Croix de Guerre. Thanks! 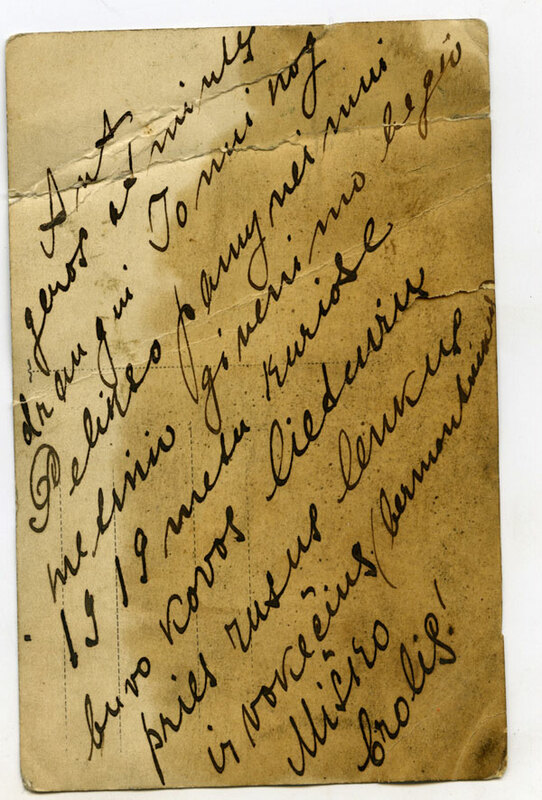 -Postcards he collected with his writing “on the way to the Rhine 1918” including postcards from Champlitte, Luxemburg, Echternach, Daun (Eifel), Coblenzand one with a statue holding a sign that says Sic transit gloria….something else I can’t make out. -a picture of him with his writing on the back: at Chalons-sur-marne September 10, 1918…also says 107 ammunition train, 32nd Div AEF, chauffer C. suria, El Centro Cal. 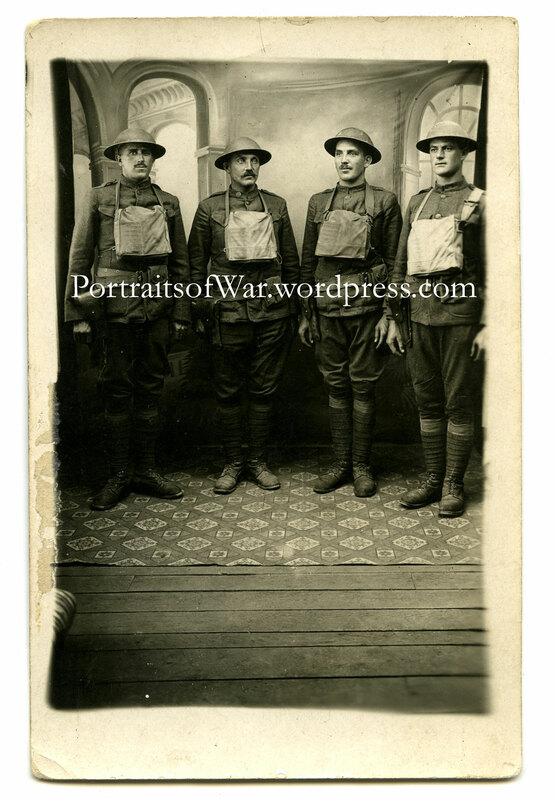 – I have a newspaper clipping of him and others sitting together titled “Commander of Michigan Guards at Grayling”…reading from left to right member of brigade staff: Major E.H. Campbell, brigade adjutant; Brigadier-General Louis C. Covell; First Lieutenants Wallover and L.C. Bow (my great grandfather). I am having all of these precious heirlooms preserved and would GREATLY appreciate ANY information you may have on him or his unit, division, company, movements, etc. I found him! Check your email! I am looking for any information about my grandfather Raymond Larkin Adams he was in the medical group, I have his uniform and what I believe is his medical bag. My uncle sent me excerpts from a diary he kept in France and I am trying to go through it, I only have about 10 pages. Your grandfather was in the medical detachment of the 102nd Infantry Regiment, 26th Division. I’ve emailed you and replied. Did you receive my email? My grandfather William Henry Milford was in 78th division, 309th machine gun battalion. I have two large oval portraits in uniform 3/4 length. Do you have other photos of the 78th? Info regarding 309th m.g. bttn? I recentely adopted the grave of pvt Salvatore Buscemo (Salvatori Buscema). He was killed in action on aug 30 1918 In Belgium and was burried at the Flanders Field cemetry at Waregem, Belgium. I received his draftcard and his registrationcard but it would be fantastic if I could give the grave a face! He served in the 105th infantry – 27th division. Could you help me to find some more information or (maybe, maybe) a picture? of City Hall in Portland Maine. I would love to have a copy of it. This is a wonderful site for World War 1 information. 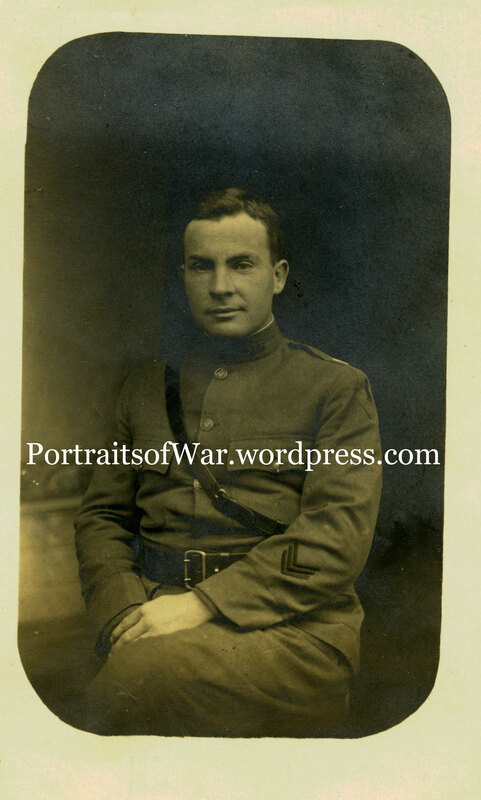 He trained in Plattsburgh and was appointed to 2nd Lieutenant on August 15th, 1917. 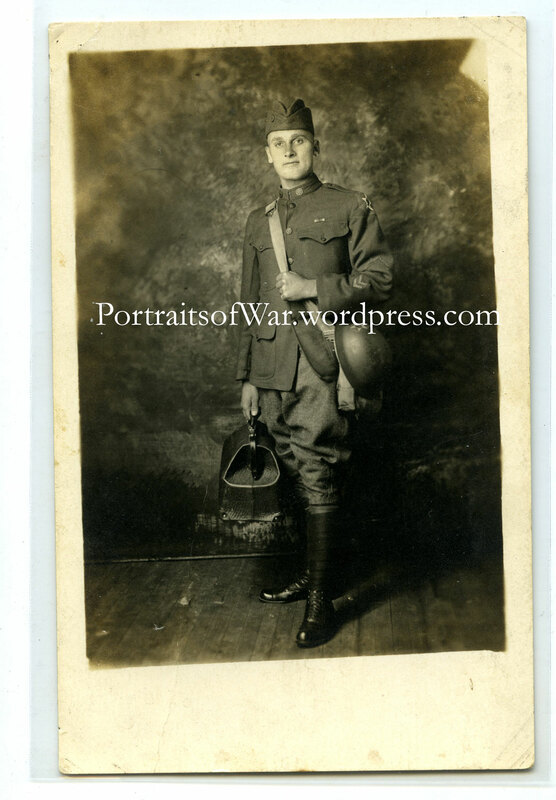 He became a 1st Lt. on October 12th, 1918. He traveled overseas with the 101st Infantry Regiment but later took a command with the 126th Infantry of the 32nd Division after his debilitating wounds. He was earlier gassed and severely wounded at Chateau Thierry on July 18th, 1918 He was again severely wounded by shrapnel injuries that temporarily caused blindness on October 24th, 1918 during the Meuse-Argonne Offensive. I’m working on finding a portrait shot of him. There should be one in the unit history for the 101st Infantry Regiment. I also found a 1922 article talking about his run for Congress? Apparently he recieved 4,786 votes and lost out to a Republican. Dear Brennan, Thank you for all of your efforts and your quick response. Such a glorious site. Look forward to hearing from you again. Eleanor D.
This site is truly amazing. I am the command historian for the Maine Army National Guard, and do a lot of research on our World War I units: 103rd Infantry, 101st Trench Mortar Battery, 56th Pioneer Infantry, and the 54th Artillery (C.A.C.) You have by far the most incredible collection of photographs I have ever seen, and love seeing new ones from our units. It’s such a fascinating window into history. Thank you so much for your preservation work. Sorry for the delay. I’ve been responding to tons of requests these past few months and am just getting back to tracking down your father’s photo. I’m hot on the trail! Just found your site, It is amazing. 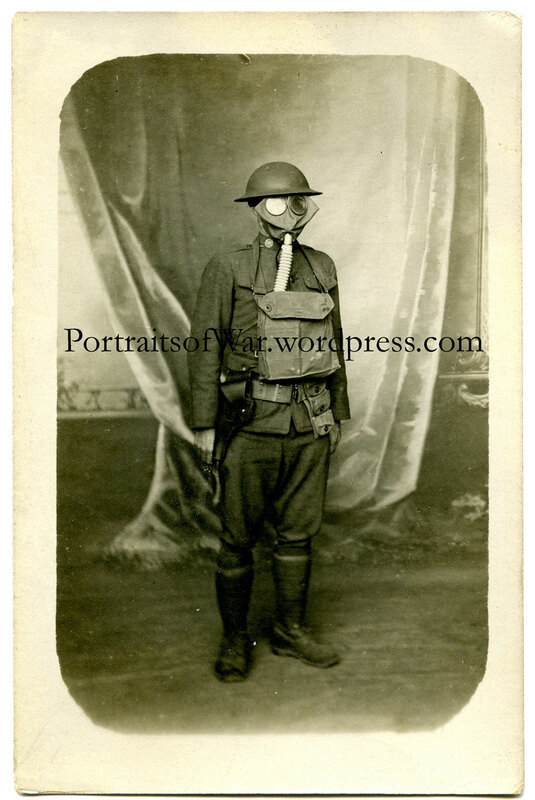 I am perusing photos of WW1 soldiers for our local community theater production of The Glass Menagerie. The script calls for a large head shot photo of a smiling WW1″ dough boy.” Any assistance would be appreciated. Wow! I just stumbled into this great site. My grandfather, Edward M Roberts from New Britain, CT, was in Company C of the 307th Infantry. I have tons of info about his unit but no photos of him. Were all soldiers photographed by the Army? I assume any photos of him were lost in the 1973 Fire at the PRC in St. Louis. This is an amazing site, and your dedication is a blessing to many. 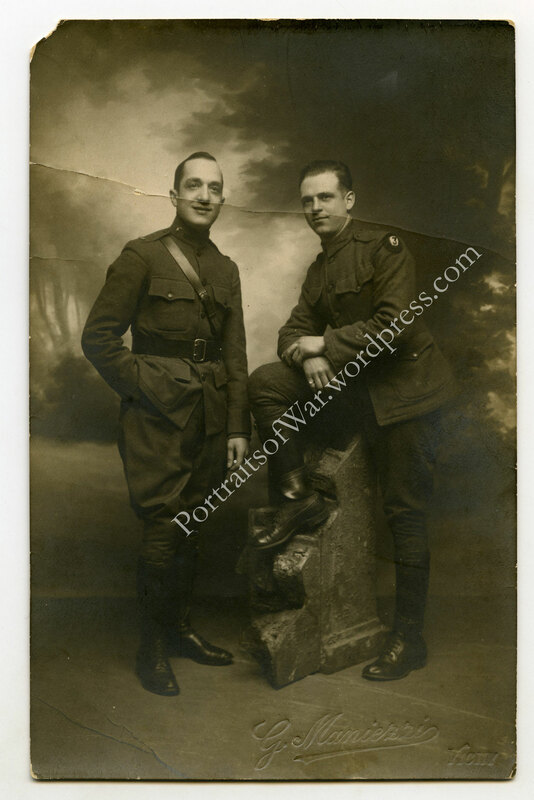 My grandfather rarely talked about his time in France during WWI. We know he was wounded on July 18, 1918 (according to his purple heart records), and that he was a part of the First Division. We think he was wounded near Soissons, and know that the 28th, 26th, 16th and 18th infantries were in the area on that day. Can you find out which one he was with? We have a portrait of him on which he had written over the bronze collar insigna with “1 C” on top and “B” on the bottom. 1C is 1st class what is his name? You can download a form from the National Personnel Records Center in St. Louis. Fill out what you know and send it in. Most Army records from 1912 to 1960 were lost in a fire but they should have a serial number and unit. Mr grandfather Edward James Brown Jr was with the 145th infantry, company M (37th division.) 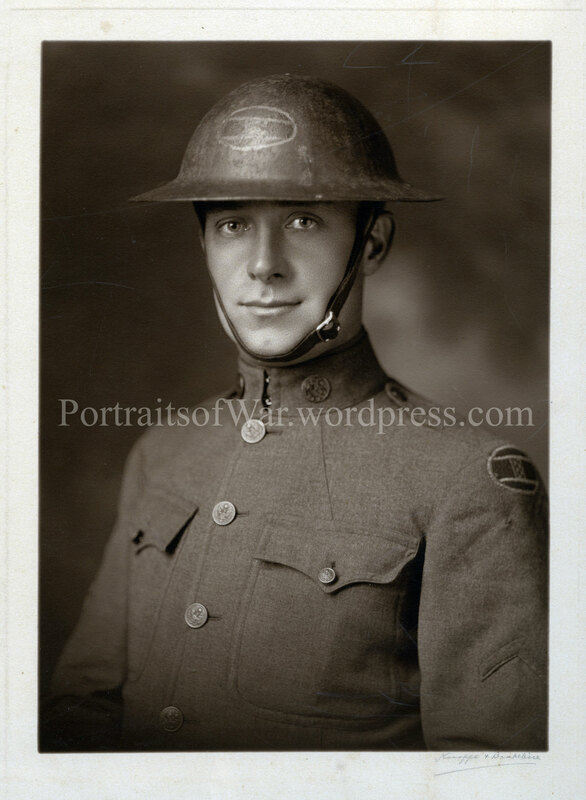 He was an enlisted manoriginally in the 16th Engineers who went to officers training camp in Langres, France and appointed 2nd Lieutenant on July 9, 1918. 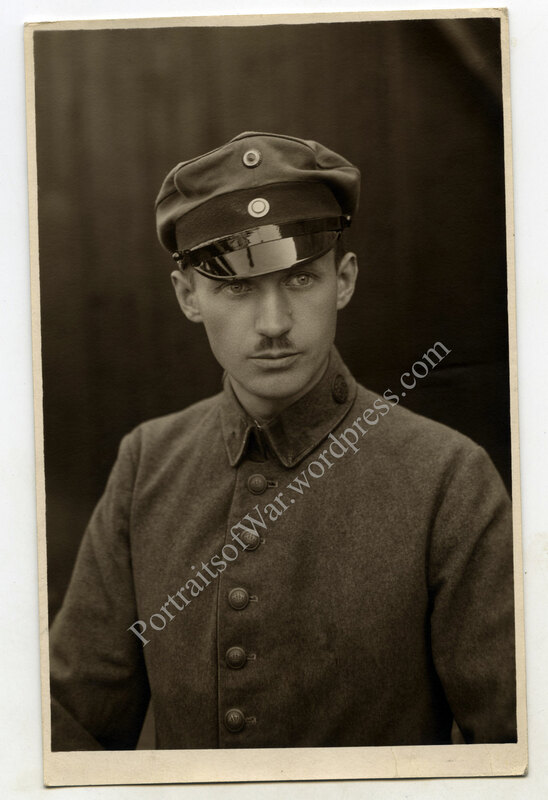 I have two photos of him, one from around August, 1918, and one from around February 1919. I find it interesting to compare the two. The first one I imagine he has a “deer in the headlights” look to him. I can email the photos to you if you are interested in them. I was curious if you could possibly dig up any WWI information on Edward U. Moore. He was born June 9th, 1898 in Canon City, CO. All I know is that he was severely wounded at Chateau-Thierry with the loss of his left leg. He may have possibly been in the 2nd Division but I am unsure of this. My grandfather, Thomas G. Maguire served in Battery A of the 101st Field Artillery, Yankee Division. Happy to share info on Battery A and some pics I have, as well as connect with others with a connection to this unit. Just found your site, was delighted to read the two letters from Clarence Everett Hall. He was my grandfather. The letters were sent to his sister, Marion. if you ever find any more info about him I would love to know about it. So nice you have saved and collected so much info,. Otherwise people like me would never have the chance to see it. 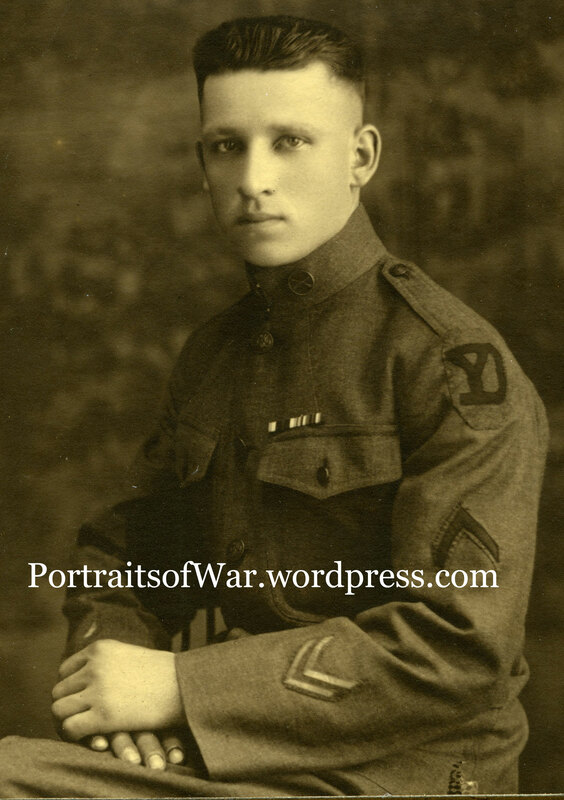 Portraitsofwar – My great grandfather served with the 20th Engineers 9th Bat in France during WWI. I saw one of your comments was that this was a unit you enjoyed researching. I was wondering what type of information you have on the 20th. I have found it difficult to find resources for reference. I’d love to see pictures, propaganda, letters home, etc…I’m trying to find out more of what my great grandfather’s time was like in camps here stateside as well as in France. I’d love to bend your ear if you have the time. Shoot me an email at Brennangauthier1986@gmail.com. I’m fascinated by the more obscure occupations during the war, and the 20th engineers are one of them. Hello – Very glad to have come across your site today. I am researching my Great Uncle, Harlan W. Chamberlin, who was a Private, U.S. Army, 103rd Machine Gun Battalion, 26th Division. He was from Vermont, and died on July 18, 1918 (do not know if he was wounded and then died later, or if he died on that day). He is buried at Aisne-Marne American Memorial Cemetery in Belleau Wood, France. Would you happen to have any information about him or his Division/Battalion? Would there be any photos of him or any documents to download? Thank you for all you do for everyone on this site; who are researching their departed relatives, who have made the ultimate sacrifice for their Country. I can certainly try to track down a photo of him. Give me some time and I will get back to you if I do indeed succeed! 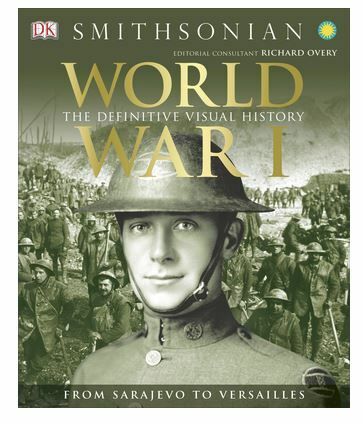 Regarding your photo of unknown WWI soldier from Vermont. I may be of some small help. My Great Grandmother’s brother was Richard Truell Corey – from Newport Vermont. Richard T. Corey enlisted in Company L 1st VT Inf. April 1898. He served in the Spanish-American War and Mexican Border Service as well as WWI 1917-1919. I have photos to share – but I am not sure how to do that on this sight. I don’t think the photograph is Richard Corey – but perhaps you will see it differently. Let me know – and Thanks! I was hoping you could help me locate information on my grandfathers who served in WWI. Lieutenant Samuel Hynes Riggs. The only picture I have of him in uniform shows him as an infantry LT, two overseas chevron bars, wearing a District of Paris shoulder patch. I do have one of his infantry insignias that has a “CR” on top and a “B” on the bottom. Before he died he gave me an Iron Cross that he said he got from a German in the Argonne Forest, but who knows. I also have a red, white and blue (I thin as it is faded), Fourragère aux couleurs of his, but I have no idea what it was for or even if it was actually his or something he acquired as he is not wearing it in the picture I have of him. My other grandfather was Cecil Forrest Dawson. His diary has him in the 48th Field Artillery as a 1st lieutenant, but I have another picture of him as a captain after the war. His diary says he arrived in France 30 December 1917. 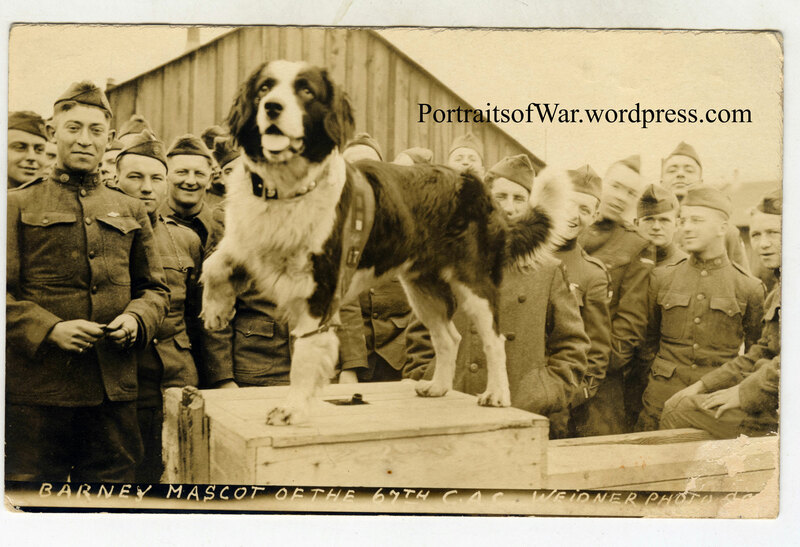 In March 1918 he was attached to the 148th FA. Then in August he was attached to 1 BN 42nd FA. He discusses being assigned sent to Gas School on August 28th, then his diary skips to after the war on November 28. He says he boarded a ship in France on November 18 headed home. He begins to describe what happened after gas officer school when he returned to his unit on 7 September, but for some reason he never finishes. Trying to figure out what happened to him between 7 September and the end of the war. There is also no mention in his diary of his promotion to captain. Kellie–you might also ask at the National World War I Museum in Kansas City. Fabulous museum! It’s another place you might consider donating George Harmon’s uniform. I hope you figure out which photo is George’s. 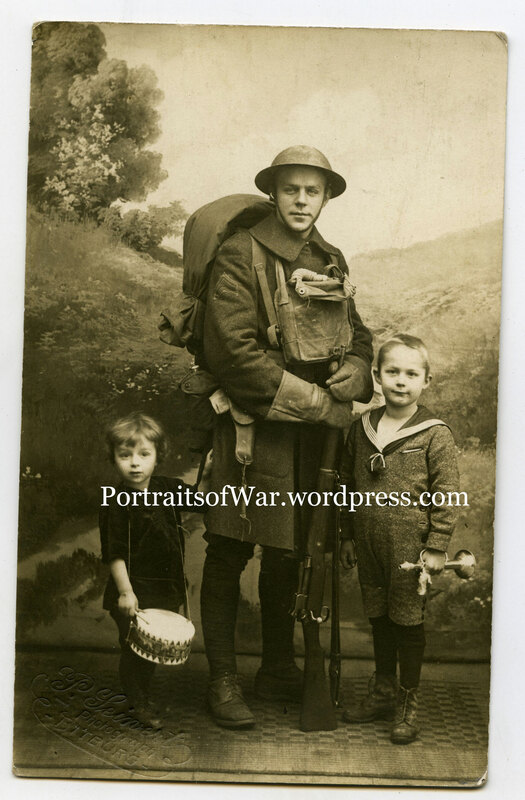 I’m still looking for William Boylen (101st-Co. L-26th div)–a photo. Good luck with your search! LG. Awesome. Thank you. I will do that. Follow-up–did you donate the uniform to the museum? And, I finally found a photo (newspaper) of William Boylen! Took years but was successful. 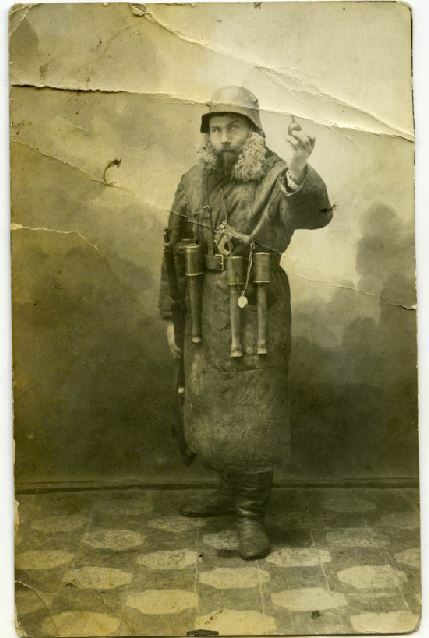 It is a photo of my grandfather in World War I. I’ve been told that he was a lieutenant in the war and was wondering if you could offer any insights just from seeing his uniform and any other noticeable feature. You have more expertise in what to look for in these old photos. I thought it was particularly interesting because it combined baseball and military. As you can tell from the blog, my grandfather is front and center in the photo. His name was Robert Joseph Landry from southern Louisiana. 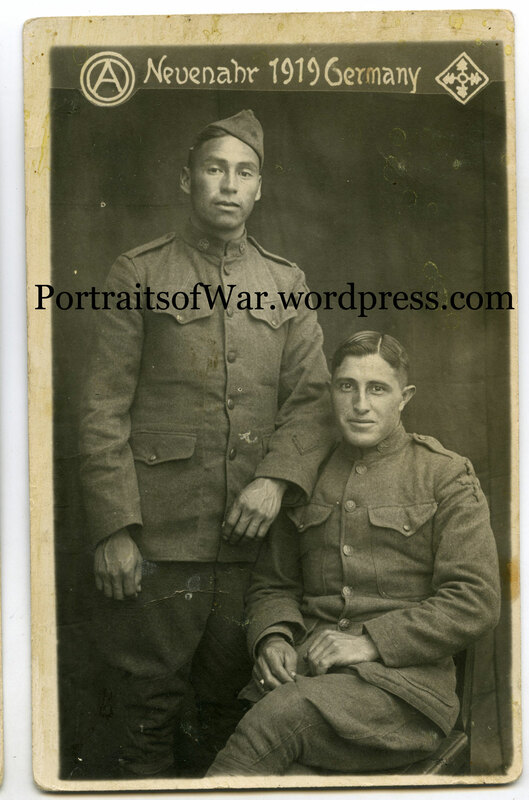 Do you have any information of the Native American soldier from the Edisto Natchez-Kusso tribe in SC? I sadly don’t. It was purchased by an ebay seller at a local yard sale and the woman said it was her father and that he was edisto. I purchased it from the ebay seller. Looking as well on WW1: my grandfather John Friesen, S# 87521, 1st North Dakota, Company K, 164th Inf. This division was apparently split up to fill in other units in France. Any info of where he might have served would be appreciated. Thank you for this website. I found a picture of my grandfather. PFC Andrew H. Knebel, 18th Co./5th Marine Regiment. Shot through both eyes by a German sniper at Belleau Wood……… blinded for life. I never knew where he was wounded, greatly appreciate your efforts. Maureen, Wow! Great! I’ve been in contact with a few of your family members about him. It was fun yet sobering to research the photo. What a gem to find this site! My 2x Great Uncle is somewhere in the yardlong of the 131st. 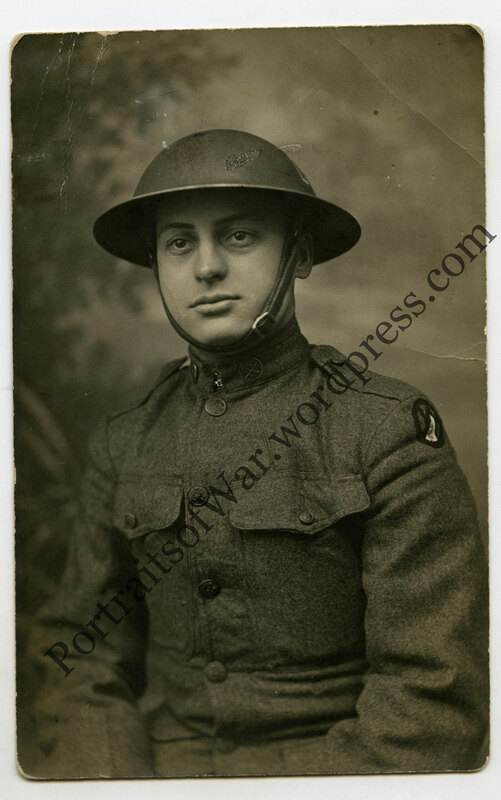 I’d love to find a picture of his brother, Ernest Bleiker, who served in the 90th Division, Company A, 357th infantry. Born in 1895 and died in 1972. Hello, I am looking for a photograph of my Grandfather Walter Emmett Pike. He was in the Army and awarded the purple heart at Chateau Thierry. He was from Haverhill MA, born April 7, 1898 died April 4, 1981. Oddly enough none of his 13+ grandchildren have any images of him. I thought since he was a purple heart recipient there might be an image of him. He was Co. F, 104th Reg US Inf. wounded July 18, 1918. Thank you for any help or thoughts of places to inquire. 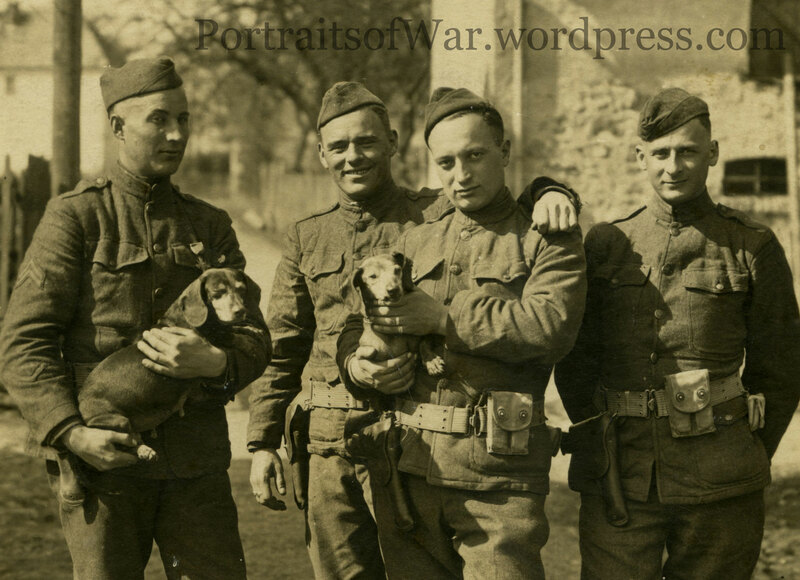 Try the online photos WWI on the Massachusetts State Library site. Hit or miss but worth a look. Someone just told me about the war portraits recently. You’ll see where to go on the home page. My soldiers weren’t there but yours might be. Good luck! As always, an outstanding website dedicated to the memories of those who went to the first industrial war in the hopes of bringing peace and democracy to the world. Their sacrifice and efforts set the tone for future generations of Americans would commit themselves to assist the world in bringing liberation, prosperity, and better lives to the world by their efforts and example. George Carey [Former Archbishop of Canterbury] … asked [Secretary of State Colin] Powell whether the U.S. was relying too much on “hard power” such as military action as opposed to “soft power” such as appealing to the common values of the major religions and building trust based on those values. [Former Army General and Secretary of State Colin] Powell responded by affirming the “soft power” of values but that it was the “hard power” of the military that, for example, helped free Europe and so the “soft power” of peace and reconstruction could take place. From the World Economic Forum in Switzerland in January 2003. My great grandfather served in Company F of the 103rd. I spent a lot of time researching the unit & reading available material. I think I spotted him in the Company Photograph in Colonel Hume’s book. I feel pretty luck to discovered this info.